Just 30 miles from the place I am writing this post 242 years ago on July 4th the Second Continental Congress officially adopted the Declaration of Independence. So the July 4th of 2018 marks the 242nd anniversary of the founding of the United States. It was the major turning point in the world's history still not fully comprehended. the 230 years old U.S. Constitution is the longest surviving constitution in the world where lifespans of national constitutions are on average only mere 17 years. Here are the signers of the Declaration depicted at the iconic painting by John Trumbull. The painting is on display in the United States Capitol rotunda next to the statue of George Washington. George Washington did not attend this session of the Congress because in July 1776 he was in New York preparing to defend Manhattan against the British. The painting is as close to a documentary material source as was possible in the pre-photography era. It was created between 1817 and 1819, at that time Trumbull was able to paint many of figures from life, he also visited the Pennsylvania State House and depicted the actual chamber where the Second Continental Congress met. However, as a lot of painters before him, he took a liberty to modify the reality to express his vision - the painting depicts 42 of 56 signers but has some characters that did not sign. There is even a belief that as a way to sign the picture Trumbull painted himself as one of the additional characters. Despite the picture name given by Trumbull, 'The Declaration of Independence, July 4, 1776', the date the painting depicts is not actually the 4th of July, it is June 28th, when a draft of the Declaration of Independence was presented to John Hancock, the president of the Continental Congress. The five members that presented the draft of the Declaration are John Adams, Roger Sherman, Robert Livingston, Thomas Jefferson and Benjamin Franklin. There is a funny belief associated with the painting - it looks like Thomas Jefferson is portrayed stepping on John Adams’ foot, an action symbolizing the pair as political enemies. Here is an enlarged part of the painting and I’ll let you be the judge. IMHO, there are two separate questions to answer regarding this belief: 'Is this action in fact depicted in the painting?' and 'Could it happen in reality?'. My answers are: 'probably not, but could be perceived as such' and 'no'. According to their biographical materials, Adams and Jefferson first met in 1775 and became close friends. Adams personally selected Jefferson to draft the Declaration of Independence. They remained close friends up to 1780s, well after 1776, the year the painting depicts. Their relations started to deteriorate in the 1790s when Jefferson was the secretary of state and Adams the vice president and became even worse later when they run for president against each other. However, they resumed their friendship in 1812. Strangely enough, both men died on the same day, the 4th of July, exactly 50 years after the event in which they were the major contributors. John Adams last words were 'Thomas Jefferson Lives', he did not know that Jefferson had died five hours earlier. The George Washington iconic sculpture displayed next to the painting is the most recognized and most authentic image of George Washington. 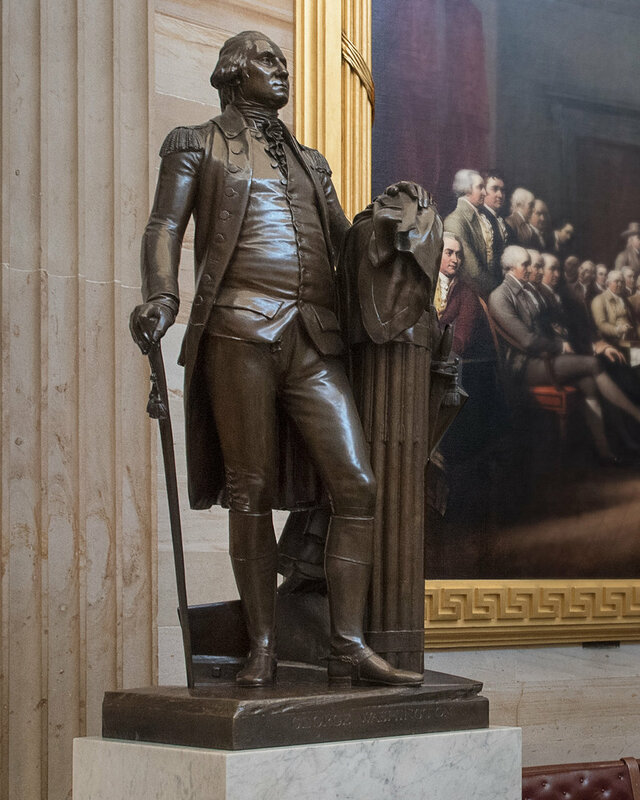 George Washington, in bronze, by Jean Antoine Houdon (copy cast in 1934). took measuremments of his body and modeled a terra-cotta bust of Washington. He returned back to Paris with copies of the mask, bust and measurements. Washington, as humble as he was confident, initially was not willing to participate in such extreme artist activities but was convineced by reasoning that they were necessary for accurate historical records. Also Washington declined the idea to portray him wearing the garments of a hero from ancient Rome which was a standard practice at that time. Instead Houdon presented Washington as a mix of farmer and general, wearing his uniform but holding a civilian walking cane. As a reverence to the classical tradition Houdon placed a farmer’s plowshare behind the general and positioned his left hand on a bundle of thirteen rods, the Roman symbol of civil authority, to represent the unity of the thirteen original colonies. Although, today we perceive the statue as a rather formal image at the time of its creation it was a revolutionary representation, a humble down-to-earth image of the America's greatest hero.